Thank you for all the congratulations and well-wishes, everyone. How lovely to have so many comments! So yes, I am engaged to be married to my best friend in all the world, and I'm trying very hard not to melt into a puddle of cliches and sappiness. All the things I swore I would never be I suddenly find that it's difficult not to be! Although I must say I've done quite well at being calm and low-key about the whole thing. We haven't even told most people; we've just waited to see if people notice this beautiful new piece of jewelry adorning my left hand. Which brings me to one of the cliches, you see... I can't stop looking at my hand. While I'm typing at work, I find that the ring distracts me. While I'm reading, I put the book down to gaze at my finger. Am I pathetic, or what? But it's just so pretty. By the way, in the picture I posted it looks sort of yellow-ish gold-ish, so just to clarify, it's actually platinum, and quite perfect and beautiful. FavoriteBoy picked it out himself, and yes, the proposal was a surprise -- although now I know that he had asked my father back in April when my family was out here for my senior recital! In other news, not nearly so earth-shattering, I turned 23 years old on the 10th. I feel rather old -- I've realized that 21 was the last "young" milestone, in which a person is looking forward to some newfound freedom or other. After that, all the milestones are the "look-how-old-you're-getting" sort, which will be rather odd. But I realized that I am 23 now, and I will be married while I am 23, which makes it all feel very soon! FavoriteBoy and I went out to Southern California for a few days, in which we attended his grandfather's memorial service, I met a million of his extended relatives, and he met my sister. I have some nice pictures. For tonight, I will post just one. More will follow later. Happy (belated) birthday! I remember 23 being a rather strange age to turn too. I remember feeling like I was supposed to be fairly "grown up" (whatever that is!) since I was done with school and all, but still feeling so young because I was younger than just about everyone around me. It probably didn't help that I was so much younger than everyone I worked with - probably by a good 8 years! 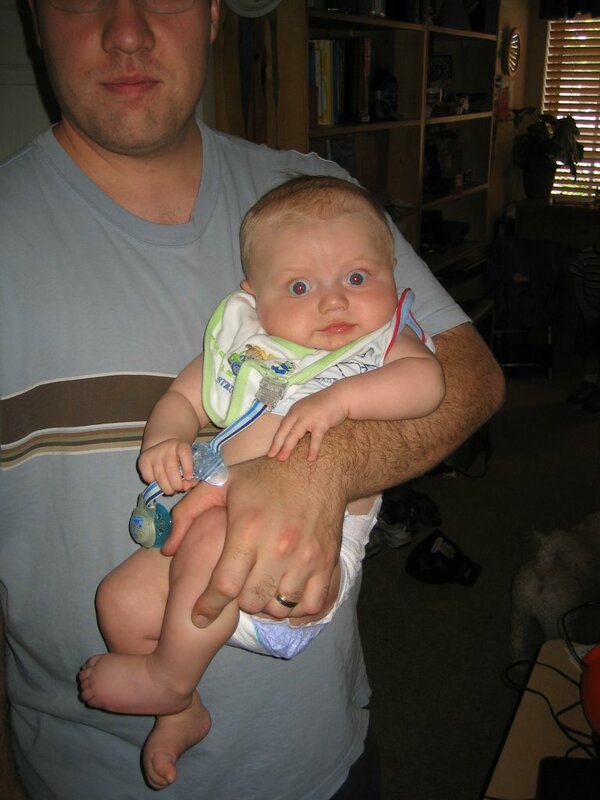 I love that baby picture - the expression on the baby's face is great! !